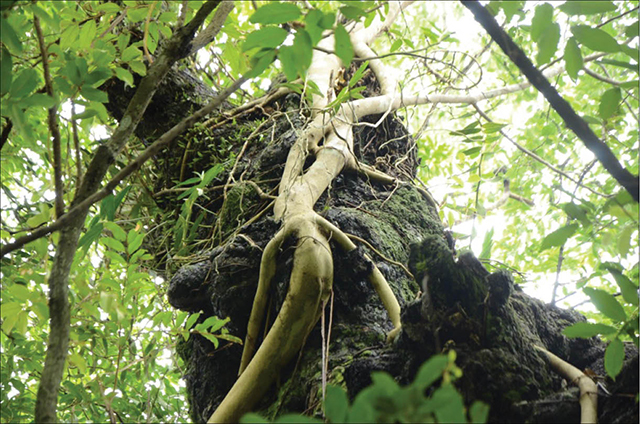 The 500-year-old heritage golden apple (Diospyros decandra) tree in Phuoc Tich ancient village is one of the five ancient trees in Thua Thien Hue which has been recognized as a heritage tree of Vietnam. Due to many impacts, the tree is at an increasing risk of potentially dying from diseases or breaking in large storms. 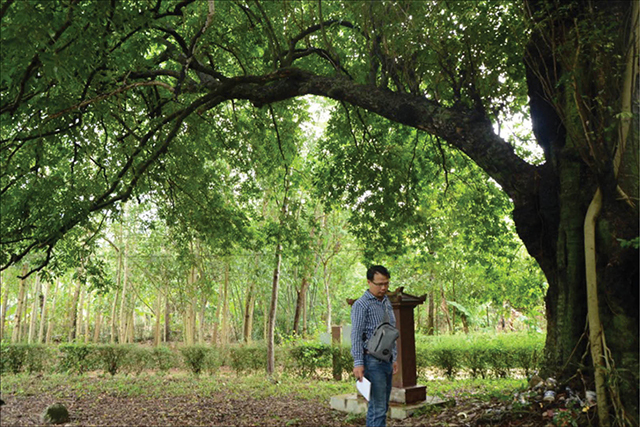 The Institute of Monuments Conservation, Institute of Natural Resources and Environment, Hue University have signed a contract on the "Survey of the heritage golden apple tree in Phuoc Tich ancient village, establishing technical measures to ensure the tree’s survival and growth." Immediately after signing the contract, the Institute of Natural Resources and Environment, Hue University set up a unit to survey the site and identify factors affecting the tree and factors impacting the tree negatively in order to provide feasible technical solutions for the rescue, protection and care of the heritage golden apple tree. The Institute of Natural Resources and Environment, Hue University also organized a consultation workshop on "Establishing technical measures to ensure the survival and growth of the heritage golden apple tree in Phuoc Tich ancient village, Phong Hoa commune, Phong Dien district, Thua Thien province". Dr. Truong Thi Hieu Thao, a botanist from Hue University of Education, highlighted the biological, ecological and classification characteristics of the heritage golden apple tree and introduced a list of plant species living on the bark of the heritage tree. In particular, a liana is developing a root system that encloses the golden apple tree trunk. This plant must be eliminated. Mr. Tran Hieu Quang, M.Sc., from the Institute of Natural Resources and Environment, Hue University presented 3 categories of technical solutions to rescue, protect and care for the heritage golden apple tree, including the category of solutions that directly impact on the heritage tree (removing the liana, lichens, algae and ferns; making frames to protect the branches with the risk of breaking; pruning and creating canopy); the category of solutions to improve the surrounding environment (cleaning and removing rubbish around the roots; removing forest trees around the heritage tree that have potential negative impacts; removing power poles out of the tree’s canopy, etc. ); and the category of solutions relating to the community (specifying regulations for visitors and pilgrims to limit the burning of candles, incense, and votive paper under the tree; setting up management measures with regulations to protect the heritage tree; building funds for the care and conservation of the heritage golden apple tree; raising awareness of the people about the protection of heritage trees ...). Attending the discussion, the participants contributed many ideas for the contents of the reports. Overall, the participants highly appreciated the Institute of Natural Resources and Environment, Hue University for their work and were in agreement with the results of the survey and the technical solutions proposed by the Institute of Natural Resources and Environment, Hue University. In addition to the above solutions, attention should be paid to the treatment of the tree’s hollow. Although there is an opinion that the heritage golden apple tree has been living with the hollow for almost a hundred years, the hollow is the culprit behind the reduction of the life span of the tree. Biologically speaking, the development of the hollow is inevitable in mature golden apple trees. The hollow increases with the growth of the tree. If the tree is healthy, the new wood growth will increase the diameter of the trunk, compensating for the hollow to help the tree transport water and mineral salt from the roots to the leaves. However, if the trunk is damaged too quickly by external factors (fungi, bacteria, insects, etc. ), the hollow will develop excessively, which decreases the mechanical resistance of the tree and create an environment for micro-organisms to penetrate deeply into the remaining trunk. This increases the risk of the tree breaking in storms.